AS WE GET into the busy planting season and think about our spring cereals, it is important to keep a few things in mind to help get that cereal crop started off right! Similar to winter wheat, spring cereals are very responsive to planting date. The earlier you can get your spring cereals planted, the better. In southwestern Ontario, the ideal planting date is April 10, while the ideal planting date for central and eastern parts of the province is May 15, and it is May 10 in Northern Ontario. Early spring planting of spring cereals results in more tillering and helps avoid the hot, dry conditions during the flowering period. Research at the University of Guelph has also shown that frost seeding can be an effective means of increasing yields in spring cereals (Table 1). Spring wheat that was frost seeded on April 1 compared to spring wheat seeded the last week of April showed a 41.5% yield increase. 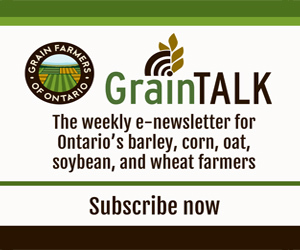 The trend was similar in barley and oats where frost seeded barley showed a 10% yield increase and oats showed a 16.7% yield increase compared to barley and oats seeded the last week in April. The weather in the spring may not always cooperate; so it is important to be aware of the implications of the variations in planting dates and how to adapt accordingly. If planting later, be sure to increase the seeding rate to compensate for reduced tillering. You may also want to consider increasing your seeding rates on heavy clay soils or where emergence may be a challenge due to a poor seedbed. The seeding rates for spring wheat, barley, and oats can vary slightly depending on the variety, so check the label for the particular variety you want to grow.